The price of cheese is determined by many outside influences completely out of the control of manufacturers and distributors. Energy costs to produce and refrigerate the cheese, worldwide demand, and the cost of feed for the cows are just a few factors considered in the pricing of cheese. Cheese is one of the biggest ingredient expenses for a pizzeria, so understanding the volatility in cheese pricing is important. But more critical, is knowing how to price your pizza based on changing cheese costs. 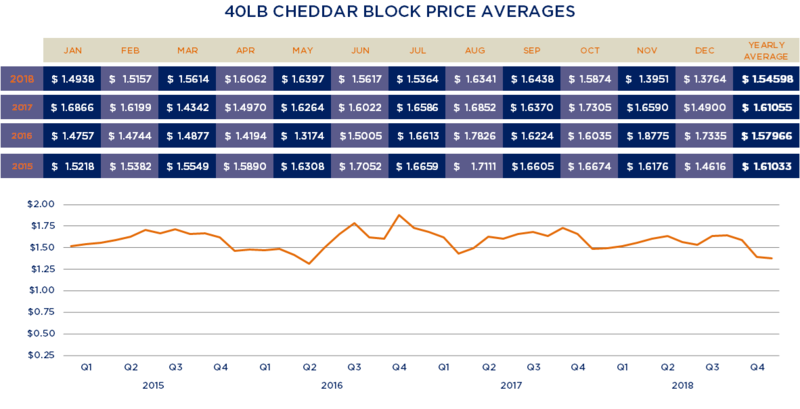 The key is to maintain a stable price based on the average market price of cheese rather than increasing and decreasing the cost of your pie on a weekly or monthly basis. The Chicago Mercantile Exchange (CME) monitors and publishes a weekly price for many commodities, including cheese. Every Friday the weekly average of cheese is recorded at cheesereporter.com, where the Block price of cheddar mirrors that of mozzarella. Below is a chart indicating the monthly 40 lb. block pricing over the past few years. The average cost during this period is about $1.59.